Face Value: Well let’s see. We have a ghostly floating girl in a flimsy white dress. We can’t see the face of course, but at least the whole body is pictured. There’s a nice simplicity to it though, the colors are strking, and I like the way you can sort of see the girl’s reflection in the water. And the overall affect does convey an austere creepiness that is totally appropriate to the story. It’s not amazing, but I totally read this on a plane with the book jacket intact. Does it Break the Slate? Well…not really. This is an incredibly original story and the way the narrative unravels is gripping. I didn’t want to put it down. But at the same time, neither of these two sisters is really a Slatebreaker at heart. Ruby – you’re dedicated to your little sister & you’d do anything to protect her. I get that. I’m a big sister too. But really? You’re super creepy and emotionally and sexually manipulative. And Chloe, OH MY GOD, stand up for yourself. I get the sibling thing, I understand that you idolize your older sister and yeah, once things get supernatural it would be hard for anybody to believe what’s going on. But it takes you a million years to figure out that things have gotten bad and then once you do, you don’t do anything about it. However, when I think about these two protagonists, I can’t decide whether their characterizations are totally original or incredibly familiar stock characters that are being used to serve the plot and the storytelling. Really, I think the title captures it exactly. These are Imaginary Girls. They don’t exist in a reality outside of each other (which is necessary to serve the story) but it means that they can’t really exist in a reality outside of this story. Who would we give it to? This book has been on my to-read list for a long time because someone described it as being “Shirley Jackson-esque.” And I will read anything that is described as Shirley Jackson-esque. It’s not quite that masterful, but it’s definitely in the right realm. I would definitely offer it up as a recommendation for someone who’s just finished Jackson’s body of work and wants more. Or to someone who likes well-written supernatural mysteries and cares more about plot and tone than character. Review: As you might have already started to figure out, I had complicated feelings about this book. It’s gorgeously written. 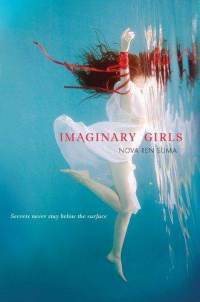 Nova Ren Suma is a fantastic writer, and she uses language masterfully to capture just the right the claustrophobic and just-slightly-otherworldly tone of the book. It’s contemporary and old-timey creepy all at the same time, with a small town that feels untouched by the outside world, yet text messages play a huge part in not only the characters’ communication but in the buildup of suspense. At the start we have two sisters, Ruby and Chloe. They’re very close – their mom was drunk and absent for much of their childhood, so Ruby spent a lot of time taking care of her younger sister as they grew up. Now that Chloe is in high school and Ruby is in her early twenties, Ruby is still deeply protective of Chloe and Chloe idolizes Ruby. But at a party one night, Chloe swims across the reservoir at Ruby’s suggestion and discovers the dead body of a classmate. The emotional impact is huge and Chloe is sent away from Ruby to live with her dad. The next two years pass by in a dreamlike state and only a few pages before Ruby shows up, leaving bus fare for Chloe to return home to her. Chloe returns, but there are strange things happening. Something is wrong. And then things start to get paranormal and Ruby’s behavior seems even more disturbing. Throughout the rest of the book we see Chloe trying to figure out what’s really happening but not quite willing to believe what Ruby is capable of. Suma does get some points for making this a story that is all about the girls, and not defined by their relationships with men. In fact, she goes to the opposite extreme. Men are more than just not present, they are distinctly on the margins. Whether it’s Chloe’s ineffective father, one of Ruby’s blind followers or the unmemorable young man Chloe loses her virginity to, the men in this story are sidelined, both by the way they are presented in the narrative and the way the girls treat them. That’s it. A whole summer and a major life event reduced to a short paragraph in which Ruby’s name is mentioned three times (three more times than the name of the dude she slept with). Actually, I think this might be the least attention paid to losing one’s virginity in any young adult book I’ve ever read. But major events in Chloe’s life hold no meaning for her until she can tell her older sister about them. ‘Yeah?’ I didn’t stop her; I liked when she told it. ‘What was I seven? Eight?’ she said as she sped the car down the street and made the usual turn toward the rec field. ‘All I know is I was small, and I’d wheel you in your stroller and people would stop me on the street. They’d say, ‘How cute!’ Or, ‘You two are sooo adorable!’ But then they’d always have to ask, ‘But where’s your mother, little girl?’ And the thing is, I didn’t want to say she was doing shots at the bar. Or, last I saw, she was in some-dude-we-never-met’s truck. I mean, I wanted to say our mother was right there, like in a store buying earrings, right? Our mother was at the library. Our mother was at the laundromat. Someplace mothers go.’ She sighed. Um, not really, Ruby, but I think this passage is telling in that it demonstrates the ownership she feels over her sister, and how important that ownership is to her own sense of identity. Her mother failed, so she took over care of her sister, and she didn’t want to give up any of that ownership, even in name. She sends the balloons off into the air and sure enough, the next day, there are lasagnas in the fridge. “Ruby said I’d never drown – not in deep ocean, not by shipwreck, not even by falling drunk into someone’s bottomless backyard pool. She said she’d seen me hold my breath underwater for minutes at a time, but to hear her tell it you’d think she meant days. Long enough to live down there if needed, to skim the seafloor collecting shells and shiny soda caps, looking up every so often for the rescue lights, even if they took forever to come. Because Ruby says it, it’s true for Chloe. She takes crazy risks, shuts out everybody else (not that we ever even see her get close to anybody else) all for Ruby. She lets herself become the person Ruby says she is, the innocent little girl who doesn’t do anything bad, the fearless swimmer who couldn’t possibly drown while swimming across the reservoir, because as soon as Ruby says it, Chloe believes it. But it becomes clear in the story, Ruby saying something doesn’t necessarily make it true, even if everybody believes it. And Ruby is willing to go to unimaginable lengths to make her stories true and to protect her little sister. This is a gorgeous, hypnotically written novel. The language is exquisite and the mystery unfolds in a way that is unsettling, suspenseful and ultimately satisfying. However, this is not a Slatebreaking novel. I kept waiting for Chloe to figure things out, to stand up for herself, to break free from Ruby’s version of the truth and take matters into her own hands. But she doesn’t. She can’t. Chloe’s weakness doesn’t make this a bad book and it doesn’t make it an anti-feminist book. But if you’re looking for a characters to identify with, challenge perceptions and break the slate? This isn’t your book. Reviewed from copy purchased at the original Borders in Ann Arbor, MI. Yes, it was very sad. This entry was posted in Reviews, Young Adult and tagged Floating Girls, Ghosts, Mystery, Nova Ren Suma, Reviews, Sisters, Speculative Fiction. Bookmark the permalink.